It’s time to buy a compressor for your mobile service truck application. You’ve figured out what type of compressor and how much air flow and pressure you need as well as how it will affect the load capacity of your truck. Now it’s simply where you can buy that compressor the at the lowest cost, right? Well not really. Besides the installation time, there are some important installation details to consider, depending on the type of compressor you’ve chosen and what type of work you’ll be doing. For this article we’ll focus on either UNDERHOOD, Power Take Off (PTO), hydraulic, gas or diesel engine driven compressors as well as general items that can be used with all of your installations. 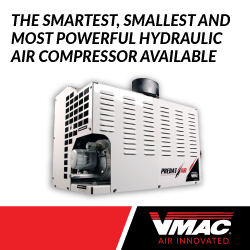 A VMAC UNDERHOOD compressor system comes complete with all of the components you need to install, up to the end of the separator tank. As these are specifically engineered for each truck application, you won’t have to worry about anything other than having the tools and skill for the install. Most systems come complete with control systems including throttle controls designed for your particular truck. Items past the separator tank will be mentioned below. PTO driven compressors generally come as a universal system with basic brackets and components. When completing the install, mounting brackets, hoses and locations will need to be figured out. The brackets will need to be fabricated and mounted to the truck. A key to the longevity of your compressor is the design and installation of the drive shaft. This is generally done by companies that specialize in custom drive shafts. The compressor speed will generally be controlled by a throttle circuit built into the truck itself. Any changes for idle speed may need to be programmed by a dealership. 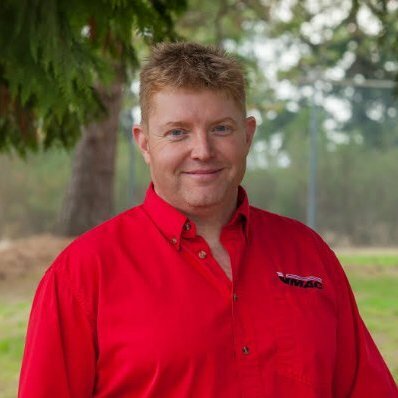 If your truck is already going to be equipped with a hydraulic system, then adding a compressor may be as simple as finding a good mounting position, plumbing hoses to the compressor and correctly sizing the hydraulic pump. The hydraulic reservoir tank may need to be bigger and depending on how many components are also driven by the hydraulic system, a hydraulic oil cooler may need to be considered. If the compressor is the only piece of equipment to be run off the hydraulic system then a complete install is required. This will include either a PTO or under the hood belt driven hydraulic pump, hoses, hydraulic reservoir tank and possibly a cooler (if the compressor doesn’t have a built in one specifically for the hydraulic oil). Some sort of vehicle throttle control will also need to be added or programmed into the truck. An engine driven compressor can be an easy installation but you should consider access to the compressor if you need to use the pull start. Some compressors share the vehicle’s fuel tank and will need to be plumbed into it. If you’ve installed the compressor in a cabinet or in the body itself, venting will be required to ensure the compressor has access to cool air both for the intake and cooling. Remote mounting control systems can also add a little to your installation. Beyond the cost to install your compressor is the accessories and components downstream of your system. These may include filter regulator lubricators (FRL), hose reel(s), de-icers, after coolers, storage/reservoir tanks, piping/hoses and air outlets. Most compressors have built in regulators to help with their operation. To ensure you get the right air pressure to your tool or equipment, adding an FRL is recommended. You’ll also be adding an additional filter to stop compressor oil, water and other contaminants from reaching your tool. The lubricator will inject tool oil into your air system to help maintain your air driven tools, if needed. Hose reels can help keep your hoses neatly stored and out of the way when you aren’t using them. Different sizes of hose can be installed depending on how much air you are delivering to your job. Work in the extreme cold? Most compressors, regardless of type, will require some sort of cold climate accessories to ensure they work when temperatures dip well below freezing. Generating compressed air will likely mean you have moisture coming out of the end of your airline. Depending on what type of work you are doing, this may or may not be a problem. If dry air is necessary, then you will need to add the appropriate cooler or dryer. Reservoir tanks can be used for cooling and storing air as well as overcoming short-term high demand situations. Some compressor systems require the use of a tank. Adding a storage tank to your air system generally benefits the operation of your air compressor. Whether you are plumbing directly from the compressor or an air tank, using hose or piping to move the air to your delivery area will need to be considered. Many service truck bodies use hard pipe to get from the compressor to the back of the truck. Fittings, hoses and piping all add to your cost but are essential to getting the air to whichever air outlet you’ll be using. The use of quick connects will speed up the changeover of tools but will need to be sized correctly. Installation time, accessory components and where/how you mount your compressor all contribute to your initial price. Be sure to ask your supplier about these additional costs before you hand over the keys to your truck for that install.